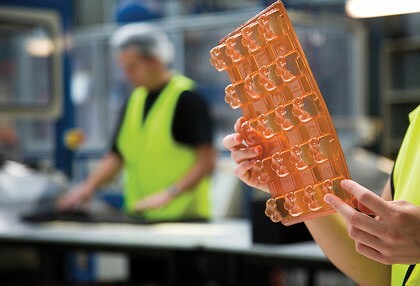 The SMH has a look at the progress being made by bioplastic company Plantic - Fantastic as plastic gets organic. A revolution in green packaging is being launched from a head office in Altona, as leading British retailer Marks & Spencer has announced that this Christmas its entire Swiss chocolate range will be sold in an innovative Australian company's biodegradable plastic trays. Plantic Technologies' cutting-edge bioplastic, also called plantic, is made from starch and is not only 100 per cent compostable but also completely dissolves in running water. It's a pretty neat trick, which has enabled the company founded in 2003 to open sales offices in Germany, Britain and the US, and employ about 50 people worldwide. The global biodegradable plastic packaging market it wants a slice of is estimated by British analyst Visiongain to be worth $US1.6 billion this year. Plantic's technology, which involves the use of industrial starch with film-forming properties, was developed from research into plastics by an Australian federal government-funded research group, the Co-operative Research Centre for International Food Manufacture and Packaging Science, involving experts at Swinburne University, the University of Queensland and the CSIRO. Morris says the research was built on Australia's ability to add value to agricultural crops. ''We don't take the whole crop,'' he says. The fact that the strain of corn used is non-genetically modified has been a big plus in the European market, while the company has also recently expanded its US presence, signing an exclusive distribution deal with Klockner Pentaplast, which is one of the world's leading manufacturers of rigid plastics. GreenBiz.com has an article looking at some of the characteristics of various bioplastics - The Material Facts About Bioplastics. Our recent webcast, "A New Life for Plastics: End-of-life Solutions in the Age of Greener Materials," drew a sizeable audience -- and a sizeable number of questions. We only were able to address a handful of them during the webcast, so we asked the three participants -- William Hoffman, environmental scientist in green chemistry at UL Environment; Robert Whitehouse, Director of Applications Development for Metabolix, Inc., a leading bioplastics company; and Kelly Lehrmann, consultant with the German bioplastics firm FKuR -- to respond to some of the remaining questions. What is the best benefit from a bioplastic: the biodegradability or the renewable source reducing the carbon footprint? William Hoffman: Not all bioplastics are biodegradable. Braskem (Green PE) and PolyOne (ReSound) both produce biobased materials which are not biodegradable. Ultimately, the "right" answer to this question would depend on the application for which the material is designed (and the end-of-life associated with that application). Let's say the material is to be used in a durable application, perhaps an appliance housing where that part needs to last the life of the appliance (approximately 10 years), then biodegradability is not an ideal characteristic. On the other hand, if the material is used in a disposable packaging application, biodegradability would be a desirable characteristic of the end-product since so much single-use plastic packaging end up in landfills. Robert Whitehouse: The best benefit is a bioplastic that is both biobased and biodegradable. As an example, Mirel™ bioplastics is made from annually renewable resources, corn sugar, and is biodegradable in a wide range of environments including natural soil and water environments, in home and industrial compost facilities where available, and anaerobic digestion. The combination of biobased and biodegradable helps to reduce reliance on petroleum and can help to reduce the amount of waste sent to landfills or incineration. What about anaerobic degradation in a closed landfill? WH: Once a landfill is closed, the conditions that encourage biodegradation – recirculating leachate, which carry microbes and elevated moisture levels are removed. Indeed, closed landfills resemble the "dry tombs" that William Rathje studied in his Garbage Project in the 1970s. RW: Landfills are typically unmanaged with regard to microbial activity and so degradation is very difficult to predict. Managed anaerobic degradation facilities typically take from 20 to 50 days for organic carbon conversion. I wonder what proportion of our biomass would be required to satisfy the world's plastic demands? I wonder how strong and durable this plastic is? EG: If it dissolves in water, it might be OK for holding dry chocolates but that rules it out for using as shopping bags carrying home cold goods with condensation all over them, it rules out using it for drinks and take away cups, and softdrink bottles, etc. Do you think markets will just want 'real' plastic after all? The poor ocean's being drowned in plastics that break down into microplastic bits that seem to be changing the food chain! On the other hand, James Hansen has joined a group recommending the plasma arc burner, which of course shoots all hydrocarbons up the flue for the petrochemical industry. So that turns old lawn clippings, dirty nappies, old shoes, toothbrushes etc into syngas which can satisfy some *demand* for plastics, and even some feedstock for some liquid fuels. But it does not necessarily change the *quality* of the plastics and make them biodegradable or safe for the oceans. Yet people LIKE strong plastics holding their ice cream. I can't see a convenient way around this... any other new materials you know of hitting the market? Is everything going towards tough waxy cardboards for ice creams? I think I covered most of this in my bioplastic article a few years ago (see link in the post). Its not perfect but its good enough for many uses - especially the stuff that can be recycled. Waxy cardboard is a good example of substitution - can't say my ice cream is worse off for it (in fact I prefer it to plastic containers).